The Helios display head by Tech Lighting features an easily replaceable LED with a screw-in base specifically designed for the Helios display head. 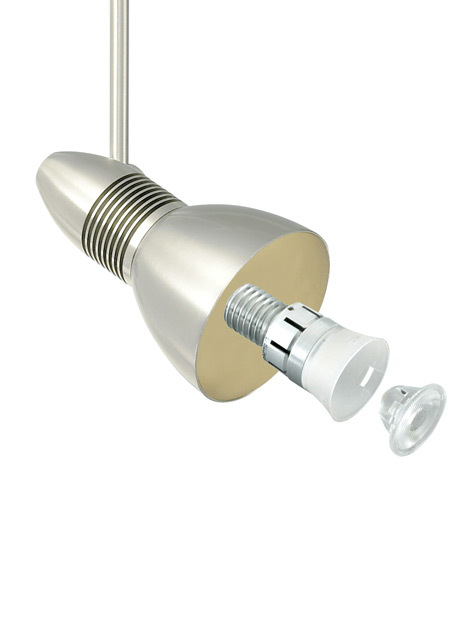 The heat sink remains with the fixture minimizing any waste at the end of the lamp module life. The Helios rotates a full 360° and pivots at 260° to direct light beam to the desired location. The Helios display head is available in two on-trend finishes and can be customized to hang at five distinct stem lengths. Diversify the overall look and feel of the Helios by combining with a myriad of accessory styles that beautifully complement the Helios head. This low-voltage display head is ideal for commercial lighting applications such as retail stores, libraries and galleries. The John ships with an integrated lens holder to accommodate a fully dimmiable MR16 lamp (sold separately). LED module is easily field replaceable with the screw-in base specifically designed for our LED head. The heat sink remains with the fixture minimizing any waste at the end of the lamp module life. Head rotates 360° and pivots 260° to direct the beam. Accessories in myriad styles and colors allow you to create the ideal custom LED fixture (accessories required. sold separately).